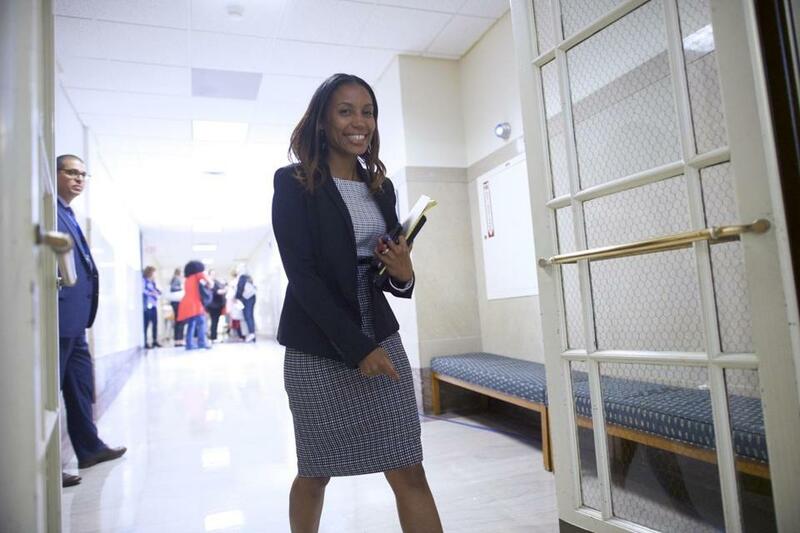 Co-prosecutor Kristen Gibbons Feden walks toward the courtroom before Bill Cosby was sentenced to 3-10 years in his retrial Sept. 25 at the Montgomery County Courthouse in Norristown, Pa.
Kristen Gibbons Feden, the Philadelphia-based lawyer who prosecuted Bill Cosby on sexual assault charges, recently received the Victim Rights Law Center’s Leadership Award in Boston. Ayanna Pressley made the presentation to Feden. Pressley, a city councilor running for Congress, is a past recipient of the award, along with Anita Hill, Gloria Steinem, Lynn Rosenthal, the Boston Globe Spotlight team, and others. The VRLC, a nonprofit law center dedicated to the legal needs of survivors of sexual assault, celebrated its 15th anniversary last week with a Shining Star Gala at the Moakley Courthouse in Boston. “I admire all the work that they’re doing,” Feden told the Globe. She said it’s important that survivors — even if they choose not to go to police or if authorities don’t prosecute — have a place to go where they can get legal representation. Feden was a part of the commonwealth legal team on the original Bill Cosby case in 2017, and served as special prosecutor in the retrial. She delivered the closing argument prior in a guilty verdict. Cosby was convicted of sexually assaulting Andrea Constand and was sentenced to 3 to 10 years in prison. Feden, who was in the courtroom when Cosby was sentenced, said that it was powerful to hear the sentence imposed. The judge looked at Constand and acknowledged her as a survivor before addressing Cosby directly and explaining that he wasn’t going to treat him differently because of his power and wealth.